Can be found at SK 46/56 452671. View from the gate to the church. Nearly a complete stone window mullion lies on the floor. The chevrons carved into the pillar may be Norman in origin. Entrance porch and stone seat. The church yard with its stone memorials to its inhabitants. 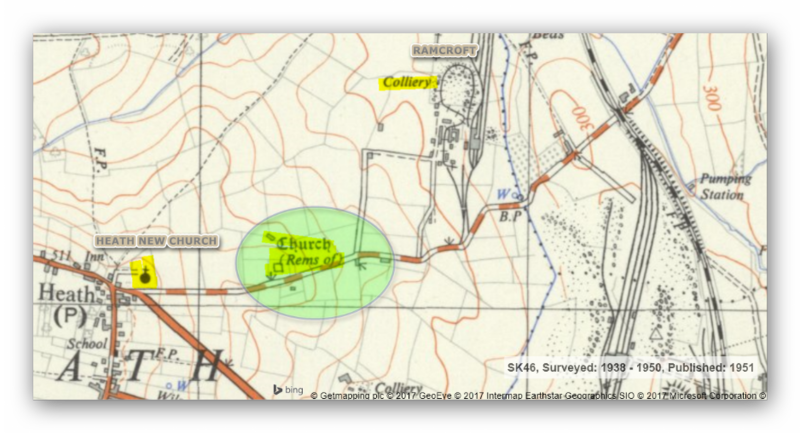 The church is on the old road to Ramcroft colliery and has long been in disuse. Photographs taken by me in January 2001. It would appear that the church may have Norman connections. The date of the building of the church is unknown but it can be traced from at least 1307 and may be as old as the 12th century about 1161. The new larger Parish Church which replaced this smaller one can be seen from the site. The new church was dedicated by the Bishop of Lichfield in July (18th) 1853. 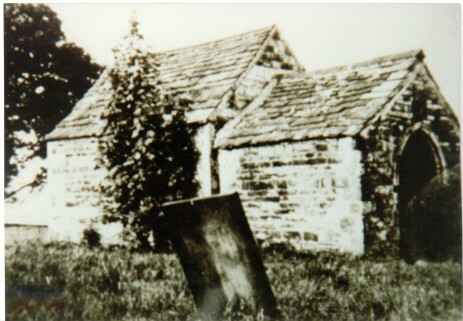 The old church being used as a mortuary chapel after that date. The church yard is kept neat and tidy and the head stones that I saw date from the eighteenth and nineteenth century. A. Windows on North side-square headed. C. Seating below a loft. D. Alter Table in Chancel. F. Porch on South side-existing. G. Two Square Headed Perpendicular windows. H. Pointed window in South wall of Chancel. J. Two decorated windows on East side. NB In a Terrier of 1824 a North door is mentioned but there is no sight of this on the plan. Many thanks to Alan Allsop. North Wingfield Local History Group. The bottom left photograph is Copyright Pete Stoddart. The bottom right photograph is Copyright unknown. Taken in 1935. 'Thought you may like this photo I took back in the early 60's. 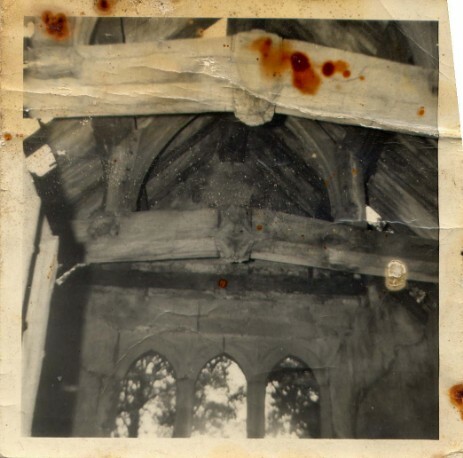 It is the inside of the old church showing the old roof trusses from the Chancel'. (As a footnote, this old ruin will be destroyed if the current plans of the HS2 run their course). Last slide show of photographs taken 25/02/2019. Video of the Church and Grounds.